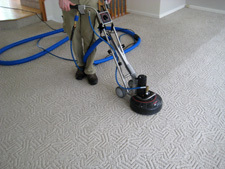 Residential Carpet Cleaning Done Right the First Time – Guaranteed. Regular carpet cleaning is essential to a healthy indoor environment, but with so many different methods available how do you make the right choice? Our ZERO Residue Hot Water Extraction method, powered by a truck mounted unit, using exclusive cleaning agents, and IICRC Certified Technicians make it the most effective carpet cleaning method available. Nothing cleans more thoroughly, or protects your investment better and it is the ONLY method recommended by most major carpet manufacturers, including the words largest, Shaw Industries. Our recommended carpet cleaning process utilizes a revolutionary truck mounted system and includes pre vacuuming, pre spotting, and applying a powerful pre spray to break up and emulsify dirt and soils. Then, we rinse and extract using 200+ Degree water and anti-re soiling agents to further clean and brighten the carpet fibers. Powerful vacuums remove the dirt, soils, and much of the water used out of the carpet and into a waste tank in our truck. Following the cleaning Turbo fans are used to speed the drying time and the carpet is groomed to restore the pile. High heat and strong suction allow us to remove much of the dust, mites, allergens, bacteria and other microscopic pollutants trapped in the carpet that can trigger allergies and breathing problems. That residue that some cleaners leave behind is actually a chemical that continues to attract dirt and grime long after the cleaning. We thoroughly rinse all of our cleaning agents from the carpet and apply an anti-re soiling agent leaving the carpet at a neutral pH level and because our cleaning process removes deep down dirt and grime, the cleaning will actually last longer. Until you’ve experienced carpets cleaned using the Mighty Clean carpet cleaning method, powered by our professional truckmounted system, you have yet to enjoy how fresh and spotless your carpets can be. Our system provides unrivaled cleaning power and deep-down suction to remove ground-in soil and revive your carpet’s appearance.